Kit Directions: Shake the bottle of Prep and apply 1/4 to 1/3 fl. oz. of Prep Solution to a dry scalp during a shower. Allow the product to remain on the scalp for 30 seconds to 3 minutes. Do not massage or rub. Rinse. Dispense 1/4 to 1/3 fl. oz. of the Purify Cleanser into the palms, spread over the palms, and apply evenly through the hair. Add a little water and work into a lather by moving the fingers against the scalp using small circular motions. Rinse. If the product did not foam the first time, repeat this step. After bathing, towel-dry the hair gently and apply 1 ml. (one squeeze of the bulb) of Botanical Scalp Activator in small dots all around the scalp concentrating in the areas of most noticeable hair loss. Wait 5 minutes before proceeding. Repeat this step in 12 hours. Apply 1/4 to 1/3 fl. oz. of the Protect solution to the scalp, then style as desired. Avoid excessive heat and products containing mineral oil, lanolin, petroleum jelly (petrolatum). Apply 1 ml. of Minoxidil to the scalp concentrating in the areas of most noticeable hair loss. You will not need a conditioner when using this system but it won't hurt anything if you add your favorite conditioner after the cleanser. 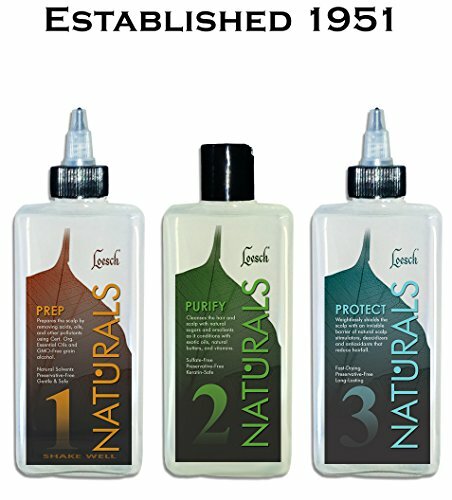 Why is it important to use Loesch products one after the other as a kit rather than just a single product by itself? Because there is no single miracle product that can treat all of the causes of hair loss in one bottle. Loesch products work like a chain with sebum at one end and water at the other end. The first link attaches to the sebum just inside the follicle. The next step attaches to the first step. Then the whole chain with a little sebum attached is gently pulled out of the follicle. Do this each day and within a month, the follicle is cleaned out all the way to the bottom and new sebum is removed before it has a chance to oxidize. This kit is designed to gently remove old sebum from the follicles and to infuse the hair and scalp with naturals oils very much like sebum but without any of the toxic by-products of sebum oxidation. Bio-Med & Pharm is an OEM cosmetics and OTC drugs manufacturer since 1974, with Loesch products since 1951, FDA registered, wholesale available, made in USA. Ship to Continental US 48 states only. If you have any questions about this product by Loesch, contact us by completing and submitting the form below. If you are looking for a specif part number, please include it with your message.